\r\n“We will allow our unwanted visitors to shut themselves into the prisons their minds create.”\r\n –Chairman Hiro\r\n\r\nThe network lies before you; which path will you take?\r\n\r\nHonor and Profit is the second deluxe expansion for Android: Netrunner The Card Game. Its 165 cards (three copies each of 55 different cards) focus on the struggles between the different divisions of the megacorp, Jinteki, and those Runners who associate themselves with the game’s Criminal faction.\r\n\r\nIn Honor and Profit, you’ll find new agendas, assets, operations, ice, icebreakers, resources, and events. You’ll also find six new identities – three divisions of Jinteki and three Runners – that encourage deeper exploration of specialized strategies. Will you raise the game’s stakes by lowering the number of agenda points each player needs in order to win? Do you dare gamble your cards and credits in games of chance? What could you do with a hand of twenty cards? Can you stage a late-game comeback? Can you make the future a better place?\r\n\r\nThe cards from Honor and Profit can change the game’s tempo, manipulate servers and the runs against them, reward diverse corporate portfolios, and help establish broad networks of trustworthy connections. Additionally, with several potent neutral cards, as well as low influence cost cards for both Jinteki and the Criminal faction, Honor and Profit introduces plenty of technology to fuel new Corp and Runner strategies for any faction.\r\n\r\n\r\n\r\nForm Is Emptiness. Emptiness Is Form.\r\n\r\nJinteki’s aesthetic is strongly influenced by traditional Japanese customs and the principles of Zen Buddhism. Its campuses blend the simple elegance and meditative qualities of rock gardens and bonsai trees with some of the most bleeding-edge laboratories in the world, most of which are dedicated to forwarding the latest advances in cloning, brain scans, and neurotech.\r\n\r\nAccordingly, how you think of Jinteki, like most things, depends greatly upon your point of view:\r\n\r\nFrom one vantage point, Jinteki may appear to be a singularly evolved company, working with an enlightened, higher consciousness toward the next evolutions of biomedicine, cloning, and human potential. You may say that they are nobly engaged in the business of perfecting the imperfect. If you adhere to this viewpoint, you may look forward to the annual reports from the company’s different divisions. After all, Jinteki is uniquely committed to its Research & Development, and divisions like Harmony Medtech (Honor and Profit, 1) are always pushing the limits of what is humanly possible.\r\nFrom another viewpoint, you may regard Jinteki as a two-faced, self-serving conglomerate that relies upon a superficial air of dignity to conceal the lethality of its network defenses, which, in turn, serve to conceal whatever secrets the corporation refuses to share with the rest of humanity. After all, even though this is the company that gives its operations names like Mushin No Shin (Honor and Profit, 15), “mind without mind,” it’s also the one that most explicitly understands and exploits the many layers of its existence in the world and on the network. If you adhere to this viewpoint, you’ll likely want to avoid confusing form for substance, lest you find yourself lured into a trap like Inazuma (Honor and Profit, 16).\r\nOf course, both viewpoints exist simultaneously among the cards in Honor and Profit. You’ll find no clues leading to an “ultimate truth” about the nature of Jinteki. Instead, you’ll find dozens of new Jinteki cards, each of which is a flickering thought, a single heartbeat, or one inhalation of air…\r\n\r\nThey Only Make It Look Easy…\r\n\r\nRunning is easily one of the world’s most dangerous occupations. Take a single step off the correct path, and you may have your brains fried. Leave a single, residual trace of your incursion into a corporate server and you may find your friends eliminated one by one the corp slowly but surely finds its way to your front door. 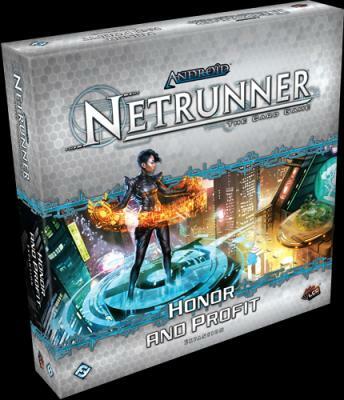 Sometimes, the hunt isn’t even all that slow, and more than a few would-be runners have found themselves tucked away in body bags, the victims of black ops that were never authorized and never took place…\r\n\r\nThe most remarkable thing, then, about the Criminal Runners of Android: Netrunner isn’t that they choose to run for a living, but that they make it look so easy.\r\n\r\nOf course, this is a case where looks can be deceiving, for the truth is that each time a Criminal begins a run, that Criminal has already put a great deal of effort into the preparatory Legwork (Honor and Profit, 35).\r\n\r\nIn Honor and Profit, you’ll find a host of new tricks and tools that you can use to plan your next run. New Run events, icebreakers, and programs like Grappling Hook (Honor and Profit, 45) all offer you the means to get in and out of Corporate servers with minimal fuss. Meanwhile, you’ll make new connections with people willing to invest their resources in your efforts, and if you’re particularly daring, you can push your luck and gamble all your wealth in underground establishments.\r\n\r\nAfter all is said and done, it may be the desire to turn a profit that sets Criminals apart from other Runners, but it’s the thrill of the run – along with all the other bluffs and gambles that running entails – that sets Runners apart from other criminals.\r\n\r\nWhich Path Will You Take?\r\n\r\nWill you follow the path of personal evolution, adopting Jinteki’s blend of tradition and innovation? Will you follow the path of personal profit, using every available tool to uncork valuable corporate secrets and sell them to the highest bidder? Or will you use the cards in Honor and Profit to diversify the portfolios of other Corps or Runners?\r\n\r\nNo matter which path you choose, the cards from Honor and Profit can help you along your way.